Home » Magazine » National » Will Laloo Prasad Yadav Be Absentee Kingmaker Of 2019? Giridhar Jha	January 10, 2019 00:00 IST Will Laloo Prasad Yadav Be Absentee Kingmaker Of 2019? Time is a great leveller, they say, and a peep into a secluded ward of the Rajendra Institute of Medical Sciences (RIMS) in Ranchi could give you a startling snapshot of how unpredictably harsh it can be at times. Lonely, forlorn and worn down by ailments creeping up on him like a pack of hyenas, there lies a man who once strode the land like an insouciant emperor. Charismatic, burlesque, irreverent of old graces—and the unmoving feudal power they rested on—he came like a messiah of seemingly apocalyptic change, almost a force of nature. 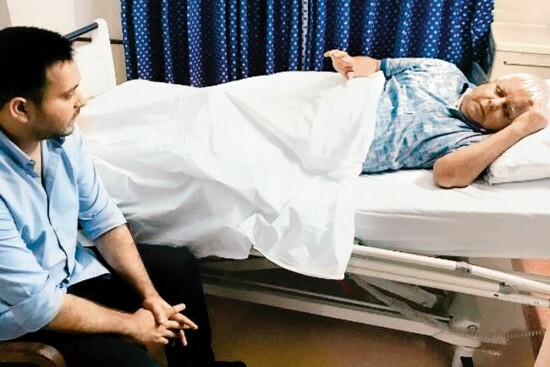 Today, the once-mighty Laloo Prasad Yadav is reduced to a mere prisoner-­patient, being treated for a kidney beginning to give way, the fruit of long and acute diabetes, while doing time after his conviction in the infamous Rs 950-crore fodder scam cases. Barring once-a-week interactions with visitors, he spends most of his time in solitude. But even in this state, you can’t take Laloo out of Bihar—as his own jokey ­proverbial coinage went—or indeed out of politics. India is beginning to simmer with pre-electoral heat, and the busy chatter of coalition match-making fills the news pages. As does the latest, stunning googly from the government that has set the whole field aflutter: a 10 per cent quota for the economically poor among ­privileged castes. Amid all this renewed focus on reservations, a vital part of the jigsaw rests here in this ward. Laloo Yadav, the old Mandal messiah, may strike you at this point as the Man Who Isn’t There, but in reality he is—the Mandal logic has structured Indian politics in such a way that a counter-mobilisation is almost inevitable. And it may well be strong enough to turn Laloo into the absentee kingmaker of 2019. And not absent either, if he can help it. Laloo is hoping to get bail from the Jharkhand High Court so he can lead his alliance yet again from the front. Last week, the court had reserved its order on his petition. He has formally cited his age (71), his failing health as also the coming elections as the reason for seeking bail, contending that, as the national president of the Rashtriya Janata Dal (RJD), he was the only person authorised to select candidates and the Election Commission would not all­ocate symbols to any party candidate without his signature. His followers now await the court verdict, a big imp­onderable in front of them. Will Laloo, the old chevalier, ride his old battlefields one more time? Will he be there, in person, as his grand alliance seeks to turn the tables on the NDA again? On the answers will hinge his own political future, also that of Bihar…one of the biggest colour patches in the political vibgyor that is India. Even after Jharkhand was hived off, Bihar remains the fourth highest contributor to the Lok Sabha, with 40 seats. Laloo’s political USP has been that his voteshare has never dipped below 18 per cent since 2005 when his RJD was voted out of power in Bihar. At first glance, no trace of this air of potential power hangs over him. Ever since he surrendered in a CBI court and shifted to the Birsa Munda Central Jail on August 30 last year, and soon thereafter to RIMS, his retinue of att­endants has disappeared—so have all the followers who once milled around him. Shorn of all the adulation he enj­oyed in his heyday, he looks a pale shadow of the bustling mass leader of old, a man who got invited to both IIM talks and film shoots. Only a faint Ozymandian pathos lurks as he now convalesces in a pay ward whose foundation stone was laid during the RJD’s long tenure, whose plaque carries the name of Congressman Shakeel Ahmad, then Bihar’s medical education minister under Rabri Devi. That old friendship with the Congress endures still. There are new friends, though, and some renewed friendships. That air of pathos is partly misleading then. Check the trickle of arrivals in the recent past. According to the prison manual (which applies in RIMS too), Laloo can meet a maximum of three people once a week. Saturday is his day. One Saturday, Shat­rughan Sinha dropped in with Subodh Kant Sahay—and Hemant Soren landed up independently. On January 5, Jitan Ram Manjhi and Sharad Yadav turned up and, on December 29, it was Upen­dra Kushwaha with Laloo’s younger son and heir apparent Tejashwi Prasad Yadav—the sight of recent partners ­taking turns for ‘courtesy calls’ is a truer index of his centrality. The odds are, of course, stacked agai­nst the cowherd boy who rose from the dusty lanes of Phulwaria ­village of Gopalganj district to bec­ome CM. Already, a special CBI court has convicted him in four separate cases, awarding him 14 years in one. The verdict is awaited in two more. Worse still, his health: a chronic kidney ailment, a heart valve replaced in 2014, a fistula surgery last year. Even if he gets bail, can he ­rec­over enough to do what he loves the most: daring his rivals, giant-­killing? Having bagged 31 of the 40 seats in Bihar last time, it’s one of NDA’s key states like UP in its ­bid to retain power in Delhi. This time PM Narendra Modi and CM Nitish Kumar are ranged against Laloo tog­ether, and the 10 per cent quota ­gambit may also come into play. Laloo was not a man in the shadows even three years ago. He was instrumental in pulling off a casting coup against the Modi-led NDA by stitching up the mahagathbandhan with his long-time bête noire Nitish and the Congress to return to power after a gap of 10 years in Bihar. It was the first such. So, in a sense, it’s he who inaugurated the current phase of Opposition strategy where entities whose joining hands would have been thought unthinkable even a day before decide to pool their strengths to form a new phalanx to breach the formidable NDA fortress. The logic has now famously been ext­ended to Uttar Pradesh and elsewhere. Laloo had campaigned extensively too for his alliance. He had twin reasons to rejoice in the end: both his sons, Tej Pratap Yadav and Tejashwi, became MLAs and also the most powerful ministers in the Nitish cabinet. But things fell apart soon. A wrathful BJP unl­eashed salvos of corruption charges against Laloo and his kin, while Nitish opted out of the grand alliance and re-embraced the BJP. And then the fodder scam ghosts caught up too. Laloo has been no stranger to court cases. Ever since the fodder scam came to light in 1996 and forced him to quit as the CM of undivided Bihar, he has been in and out of jail. But at no time in the past has it so bogged him down, alm­ost disabling him politically. Even after his first conviction back in September 2013, which debarred him from contesting any polls—Rahul Gandhi’s dramatic ordinance-tearing dates from that time—the talismanic leader had come out on bail to lead his alliance in 2014. The situation, however, changed dramatically following convictions one after another in less than a year, in various fodder scam cases. The dip in health coincided with that. So what will the summer bring? Some believe Laloo’s absence in the battleground would be conspicuous and significant, leaving the Opposition campaign floundering, as no other state leader in its ranks possesses either his stature or that uncanny ability to connect with the crowds so effortlessly. That it may finally signal the beginning of the end of the Laloo era in Bihar and India (the nth obituary, in fact). The RJD thinks none of it. Laloo’s supporters believe he shall remain a key factor even without directly participating, like a battle-scarred general who guides young troopers from the war room. The maturing leadership of Tejashwi will then face its first solo challenge. The young Yadav looks up to his father as a personification of his ideology. “Lalooji has become a veritable vichaardhara (ideology) now” is his fav­ourite refrain. Tejashwi speaks in a more measured, urbane style, but sounds confident. The RJD, he feels, ret­ains its traditional vote by dint of the sheer faith the poor repose in his fat­her—he was, after all, the first to bring power closer to them. Indeed, even after it lost power after its 15-year reign in 2005, often called jungle raj by detractors, the RJD reta­INS a sizeable percentage of votes. As Election Commission statistics attest, its voteshare is steady around 18-20 per cent even if the conversion rate into seats is patchier (see graphics). Analysts attribute this to the solidification of the Muslim-Yadav (M-Y) vote bloc (about 30 per cent of Bihar’s electorate) under his leadership over the years. But his opponents are no pushovers. Post-2005 poll results show Nit­ish-BJP has been an unbeatable combination against Laloo. With Bihar aligned with the Centre, NDA leaders claim to have heralded a new era of inc­lusive growth. A slew of minority welfare schemes launched by Nitish weaned away Muslim voters from the RJD, they say. Plus, there’s his slicing up of backward segments with an EBC/Mahadalit focus. The RJD, however, bel­ieves all that is passé. It says Nitish undid all his good work for Muslims when he joined forces with Modi. In June 2013, when Nitish severed his 17-year-old alliance with the BJP over the projection of Modi as PM candidate, it had endeared him to Muslim voters—and critics say the way he disregarded the nature of the 2015 mandate has ant­agonised them. “There’s no question of Muslims voting NDA this time,” says Tiwari. “The situation has changed. Nitish’s credibility is zilch.” Plus, the exit of Kushwaha and former CM Manjhi has hit his EBC/Mahadalit outreach. Laloo’s supporters believe he shall be a key factor in the polls even without campaigning, like a battle-scarred general guiding young troopers. Yet, the NDA is taking no chances. The JD(U) has launched a district-wise minority conference. “Besides apprising them of our welfare schemes, we tell them how the Prophet of Islam was in favour of prohibition,” says a JD(U) leader. The BJP, for its part, is zeroing in unremittingly on what it sees as Laloo’s Achilles’ heel: his tainted record. Deputy CM Sushil Kumar Modi had even penned a Hindi book, Laloo Leela, detailing all ongoing corruption cases against the RJD chief and members of his clan, including Tejashwi. The 200-page book comes months after Sushil held 40 press conferences in 2017, hurling allegations at the Laloo clan. That blitz is said to have hastened Nitish’s exit from the mahagathbandhan. Not everybody concurs. Veteran political commentator Surendra Kishore agrees Laloo’s M-Y base will strengthen and the RJD’s tally grow a bit. “Still, it won’t be decisive enough,” he says. After Laloo’s first conviction in 2013, RJD leader Raghuvansh Prasad Singh had claimed they would win all 40 seats because of a sympathy wave, Kishore recalls. “Nothing of that sort happened, RJD ended up winning only four seats in 2014.” Even in 2010, when Laloo contested in alliance with Ram Vilas Pas­wan, the RJD could win only 22 seats in the 243-member House. “Its core votes will remain with Tejashwi, the way it had once remained with his mother Rabri Devi, but it will not enable Laloo’s heirs to grab power,” he concludes. The RJD has pinned a lot of hopes on Tejashwi. “Noon-roti khayenge, Teja­shwi ko CM banayenge (We will survive on salt with chapatis, but make Teja­shwi CM),” goes an earthy slogan coi­ned by Rabri to energise RJD cadres long before the 2020 assembly electi­ons. She knows where the future lies. So did Laloo, hence his early choice of heir. But that choice has brought about its own set of headaches for the Yadav patriarch: brooding and petulant beh­aviour from elder son, Tej Pratap. Besi­des a divorce petition he refuses to withdraw, and semi-mystical trips to Vrindavan, Tej Pratap is creating a bit of nuisance by unilaterally announcing sister Misa as a candidate from Pataliputra . The relatively inexperienced Tejashwi, still in his late 20s, will thus be also battling sibling rivalry ­besides the redoubtable duo of Modi-Nitish all alone. Unless, of course, the old cowherd is out playing his flute again to Bihar.